OC scanner was only for certain 10 series and now for all 20 series cards on nvidia's side. MSI AB only features OC scanner since RTX release for RTX, OC Scanner was evga only on 10 series afair. It's a very new feature. Why should MSI mention OC Scanner when this name is explicitly used for offical 20 series cards? I don't see why you're upset if you don't inform yourself. I would like to ask you, if someone of you can tell, what's the main differenc about manually overclocked GPU and automatically overclocked GPU by the MSI Afterburner function ? I understand that main difference is about manual value insertion in Afterburner I am trying to say, whether automatic overclock function is worth to use? Any news on the "GPU usage no longer showing for AMD users" problem? Since I installed MSI afterburner " 4.6.0 Beta 9 (13338) Download" hoping it fixed the issues I was having before with the software. It fixed them. It did create a new problem though. Everytime, I start up my system, I see a pop-up message "VGA OC Tool". "During previous start-up, GPU-Z crashed at OpenCL detection". Please update your OpenCL and graphic drivers. If I click yes or no, my computer reboots on it's own. I have updated my drivers to the latest, and updated GPU-Z. I disabled XMP memory profile in my bios (I enabled it last night). I still have the issue. I took a screenshot and uploaded to the link below. It is a valid link that was uploaded to a image hosting site. The icon of the VGA OC Tool window is the same as sapphire's Trixx utility which I have uninstalled as well. check your Khronos\OpenCL reg keys for json's from devices that are no longer active in the system. Hi, is there a final official build for 4.6.0 yet ? I've been using beta 9 build 13338 with my new ZOTAC RTX 2080 AMP! and have no problems. I will try it and see if I can overclock my card again. When I try to overclock in past versions clocks have been getting stuck on my 980ti. How to overlay GPU's Power Usage afterall?? I'm searching on google at 2 days and.... nothing! I've read elsewhere to make sure that NVSMI folder is in Program Files\ Nvidia Corporation with nvml.dll in there is there. I have this on my system, and still get the error. 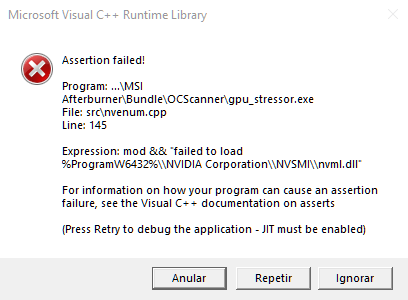 My system is 1080ti with 398.36 drivers in Win10 pro v 1803.
how to fix this error anyone know? Just ddu drivers, reinstall them with a Custom install and dont install radeon settings. Tried it, just to see if it would work. Didn't work. Not to mention that even if it did work I wouldn't be willing to lose all the Radeon settings I use, just so I can adjust my fan speed with Afterburner. I'd much rather just keep running the 18.2.1.1 and earlier drivers. So I can keep using the Radeon settings I use, and keep the ability to adjust my fan speed with Afterburner. Until somebody decides to actually fix the problem. Hopefully that happens sooner than later. thanks unwinder for your hard work.